"Nothing changes if nothing changes." This simple statement from Rob Gregory, one of the best training partners I've ever had, is so often missed in training these days. If you want to see a change in your body's appearance or performance, you need to see a change in the barbell. I have already written on why strength can limit your ability to get to your goals so now it is time to look more at how to get stronger. To get stronger you need to progressively add weight, but just how often should you be increasing your weights and how much should you increase by? Know the answer to this question and you will be on your way to success! While this one sounds so silly in theory, I see it all the time in gyms. Month after month, year after year people lift the same weight and then complain that they are not getting bigger/leaner/faster. If often have athletes ask me, “how much weight they should use?” I always answer this question with another question, “how much weight did you do last time?” The answer to this question determines the answer to the second question. However, if you don’t have a training log, you likely won’t remember. Whether it is a fancy ap for your phone or a simple notebook always, always, always log your training sessions so you can look back on them! Always remember training is supposed to be hard! It never should feel easy unless you are purposely taking a deload week or just learning technique on a new exercise. If you can do proper form for the desired number of reps, then next time, you need to do more reps or weight. While some go too light, others are over-ambitious and start too heavy. This increases your risk for injury, makes you sore (which delays recovery) and results in premature training plateaus. In echoing the wise words of great old-time lifters, Jim Wendler said it best, "start too light and progress slow." When things are going well and weights are moving up, it is easy to get greedy and try to progress too fast. Resist this urge as it will also get you injured or stuck at a weight well below your goal. Get out the small plates and watch them add up over time! When you hop from one program to the next, you may have "killer workouts" but you will not be able know if you are actually getting better at the best exercises. For more information on this, please see my previous post on muscle confusion. This option works well for big exercises. For example with the deadlift, most beginners and intermediates can add 5lbs to the bar each time they deadlift. The problem with standard jumps is that the do not work as well for dumbbell exercises and lighter barbell exercises. If a new lifter is trying to go from a 50lbs to 55lbs on the overhead barbell press or 20-25lbs on the dumbbell bench press, the weight increases are often too big. In this case, I recommend micro weight increases or standard weight increases with rep brackets. Micro weight increases allow you to progress weight each training session because the weight increases are small enough to help coax the body to get stronger without over-doing it. My favorite method for barbell exercises are micro plates (you can also use large washers). These are especially helpful for stubborn exercises like the press. 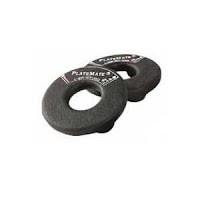 Another option is PlateMatesTM which are magnetic plates that can attach on to dumbbells and barbells. Note: if your weights are rubber-coated the magnets will not stick. 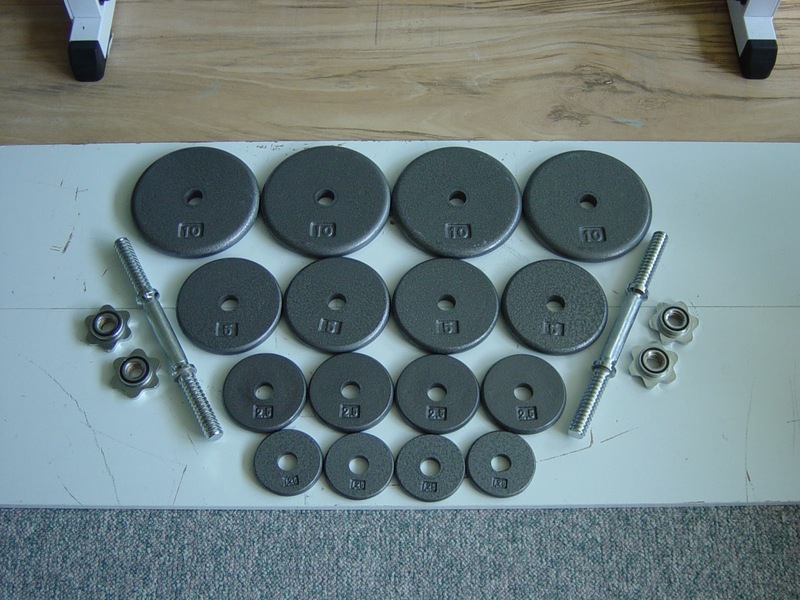 Also, if you are doing dumbbell exercises and you bang the dumbbells together (which you should not do anyway) the plates may pop off. Another great option for home training is adjustable dumbbells. 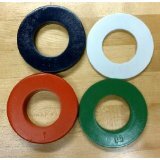 These work with standard-sized plates (have a 1 inch hole) and you can get standard plates in 1.25lbs. As a result you can simply slip one of these onto the dumbbell and how you can increase dumbbell weight by 1.25lbs instead of the standard 5lb increases. Cable exercises are also tricky for increasing weight as many cable stacks go up by 10lbs. Unless you have access to a fancy stack that allows smaller weight increases, a simple solution is to use another pin to add a small weight plate to the cable stack. When micro weights are not available, use standard weight increases with a rep range. I use this a lot for athletes in the summer months knowing that many will be living elsewhere and not able to use our mirco plates. With this method, I switch from writing a specific rep number on the program (e.g. 5) to a range of reps (e.g. 4-6). In this case, you progress reps (e.g. 1 rep more per training session) until you reach the upper end of the rep range. When this happens, you increase the weight and then start back at the low end of the rep range. I start beginners off on simple, basic whole-body routines that have them doing the same exercises around 3 times a week. With this you can start light and increase almost every training session for several weeks. For example if you started squatting the empty bar (45lbs) and added 5lbs a training session 3 days a week for 8 weeks, you would be squatting 165lbs. Obviously this will not work indefinitely At some point you will not be able to keep progressing with this method. At that point, I would classify you as an intermediate. However, until this stops working, this is the fastest way to make progress. Important note: most people think they are more advance than the really are. I advise you to hold off on more advanced programs until they have truly stalled on this method. When you are truly at the intermediate level, you will not be able to increase weight that often. 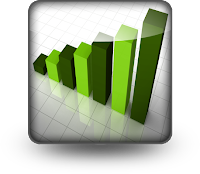 With intermediate-level programs, weight increases will be decreased to once every 5-7 days. For example, you could squat twice a week, but use a heavy squat day (e.g. 4x3) on Monday and a rep day (e.g. 3-4x8-10) on Thursday. In this case you would be squatting heavy one time per week and looking to make progress on a weekly basis. So in this case, if you added 5lbs to your squat each week for 8 weeks, you would have added 40lbs. Obviously this is not as impressive as the beginner who gained 120lbs on his/her squat in the previous example - again this is why you don't want to progress to more advanced programs before you need to. With a cycle like this, you will be gaining about 10lbs every 4 weeks. So again, coming back to our example of 8 weeks of training, the advanced trainee would gain about 20lbs on their lift in 8 weeks. Again I can't emphasize this enough: advanced training is not about making faster gains. It is about making slow gains instead of no gains. Don't use advanced programs before you have truly gotten everything possible out of the intermediate ones! Note: the concept of beginner, intermediate and advanced progression cycles comes from Mark Rippetoe and Lon Kilgore's book: Practical Programming for Strength Training, 2nd edition . If you are having a day where you are really drained, feel free to keep the weight the same or even just do lighter weights to work on your technique. However, if you have bad days regularly, you need to make some lifestyle adjustments. If you are not eating well, sleeping well, resting well and managing other stresses in life, you will not be able to recover properly and thus not be able to progress as you should. Do everything you can to recover well so you can train optimally. When have things outside of your control that effect your recovery, slow down the progress or even just maintain for a while, but things back on track as soon as possible. Remember, "Nothing changes if nothing changes." Gradually and consistently get stronger and enjoy reaching your goals!